The Learning Hub is a learning support centre provided by Student and Library Services in partnership with the University's Schools. It is an inclusive service that is offered to all Teesside University students. It provides a space both physical and virtual where you can discuss strategies and resources to help you fulfil your potential. It provides a range of approaches for learning including drop-in, one-to-one tutorials and workshops. How can you access the Learning Hub? 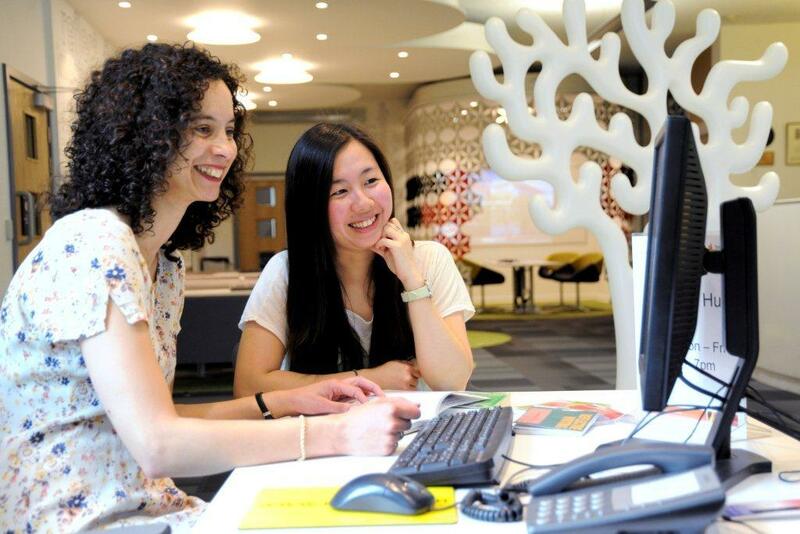 Enquiries can be made either by dropping in to the Learning Hub on the Ground Floor of the Library, telephoning (01642 342100) or by emailing (libraryhelp@tees.ac.uk). What support is available at the Learning Hub drop-in? We can offer general guidance on academic skills including the principles of academic writing. Literature searching – we can discuss and suggest the best approach to a literature search. As this is a drop in service we can normally spend up to ten minutes on each enquiry. Referencing – to improve referencing we can check a sample of your references to help you devise strategies for improvement. Referrals - we aim to identify the most appropriate source of support either within the Library or from across the University. If you require help with English as a second language you will be referred to the English Language tutors. If you require support with further developing your academic writing or with maths, you will be referred to a Learning Advisor. In depth literature search enquiries will be referred for a one to one appointment with an academic librarian. What happens during tutorials with a ...? You set the agenda for tutorials and decide on the topic for discussion. Appointments will normally be arranged on a Monday- Friday between 9-5 and will last for 30 minutes. We will help you devise strategies to check your own work but we will not proofread. We will help you to identify ways to improve your writing based on a draft piece of work. For this reason only one tutorial is offered for each piece of work (unless advised by the tutor). You are advised to email a draft piece of work in advance of the tutorial so that we can prepare feedback. Tutorials will focus on the style and structure of the student’s work not on discipline specific content. We may refer students to another source of support within the University where appropriate. We are usually only able to offer one tutorial per week (unless recommended by the Learning Advisor). It is important that you let us know if you are unable to attend so we can offer your appointment to another student. If you are unable to attend a face-to-face tutorial, we may be able to offer you an alternative service. These tutorials are for students who want to develop their use of English language. This could be to focus on the 4 skills (writing, reading, listening and speaking), academic style and register, or particular grammar items in order to improve accuracy in writing and speaking. You should bring work with you (not send it before the tutorial). We do not proofread work. We are usually only able to offer one tutorial per week. What is the role of Succeed@Tees workshops? Succeed@Tees workshops are designed to complement your studies and enhance your academic skills in areas such as academic writing, critical thinking and Harvard referencing. All Teesside University students are welcome and there is no need to book. Workshops normally last one hour. Bitesize workshops last 30 minutes. To give everyone a chance to attend, they run during lunchtimes and early evenings. The workshops aim to give you an introduction to the topic. To develop your learning beyond the introductory workshop, there is a range of online resources available.